Might this all be just a sign of a beginning paranoia of an exhausted Mum fighting to finish her PhD and to find an open-minded employer? Let’s set aside emotions just for now and turn to hard facts (because apart from being a Mum I am also a researcher), for example, to the brochure Women and Men in the Labour Market: Germany and Europe published by the German Statistical Office (Statistisches Bundesamt) in 2012. Already in the introduction, the German Statistical Office points out that low participation of women in the labour market leads to a loss of highly qualified employees. Moreover, the statistical office underlines that although there are families that do not follow the tradition pattern, they are still very rare. It is still a rule that women withdraw from the professional life if they have to take care of the family members (like children), while men occupy more important positions and earn a bigger salary. 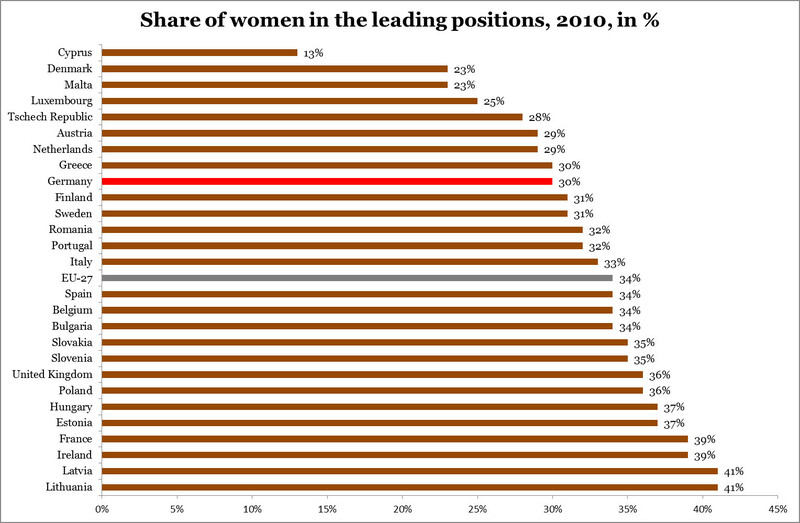 The last idea is supported by Figure 1 – Germany is below the EU-27 average as measured by the share of women in the leading positions in 2010. In the TOP-5, three places are occupied by tree Eastern European countries that must have a well developed childcare system as a legacy from their past in the socialist block. Source: Women and Men in the Labour Market, German Statistical Office, 2012. The European Commission in its recent brochure Tackling the gender pay gap in the European Union also stresses that “greater equality between men and women would bring benefits to the economy and to society in general” and that “employers can benefit from using women’s talents and skills more effectively, for example by valuing women’s skills and through introducing policies on work-life balance, training and career development”. Unfortunately for women working (or looking for a job) in Germany, Germany belongs to the TOP-3 EU countries with the highest gender pay gap (Figure 2) surpassed only by Austria and Estonia! At 22.4 per cent, gender pay gap in Germany is 7 percentage points above the EU-28 average. These differences arise not only from women earning less for the same work, but also from women working shorter hours and in positions with less responsibility as they “bear the burden of unpaid work and childcare”. These statistics again imply that EU-countries from the former socialist block (e.g. Poland, Latvia, Lithuania) tend to have lower-than-EU-28-average gender pay gap due to women participating more actively in the economic life. 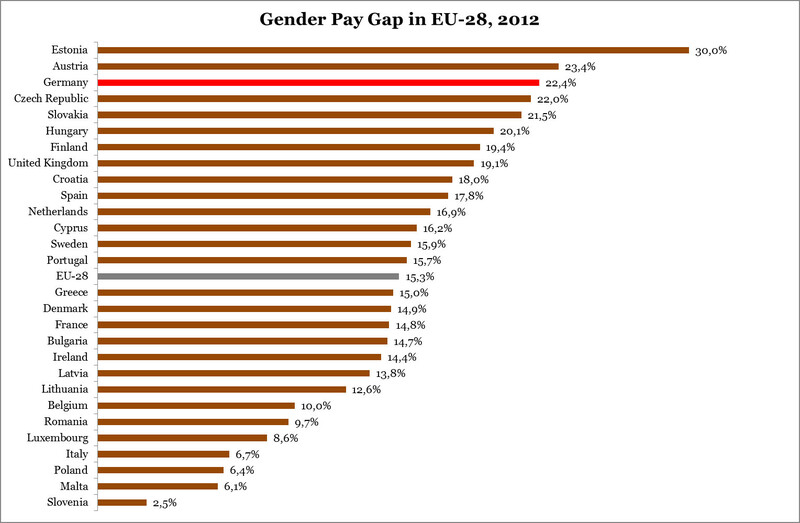 Source: Tackling the gender pay gap in the European Union, European Commission, 2014. There are also other interesting statistics on the gender equality in the EU, for example “Women and men in leadership positions in the European Union, 2013” by the European Commission. The overall conclusion is that there is still a long way to the real gender balance, Germany included. Legislation such as the quota law approved by the German parliament on 6 March 2015 requiring major companies to allot 30 percent of seats on non-executive boards to women, is a welcome change. As Reuters puts it, “although Germany has been led by a woman, Angela Merkel, since 2005, there is not a single female chief executive among the 30 largest firms on Germany’s blue-chip DAX index”. “A survey published in the Handelsblatt newspaper on Friday said 59 percent of mid-size companies in Germany did not have a single woman in a leadership position, compared to the European Union average of 36 percent”. So yes, congratulations, well done! But it is yet too early to celebrate at this point because for women to get to the board, they should first be hired by the company and be able to work there more than half-time, which is still hard, because kindergartens are open only until 16:30 and only 60 per cent of children in the primary school in Düsseldorf can stay at school in the afternoon (but in any case not later than 16:30). Taken into consideration that normal office working hours are 9:00 till 17:00 and in many cases, especially in high positions, one is expected to work even later, these conditions cannot be seen as encouraging for women who wish to combine family and career. This entry was posted in Uncategorized and tagged career, childcare, family, gender equality, gender pay gap, Germany, labour market, women, work. Women at work – is the French model better?